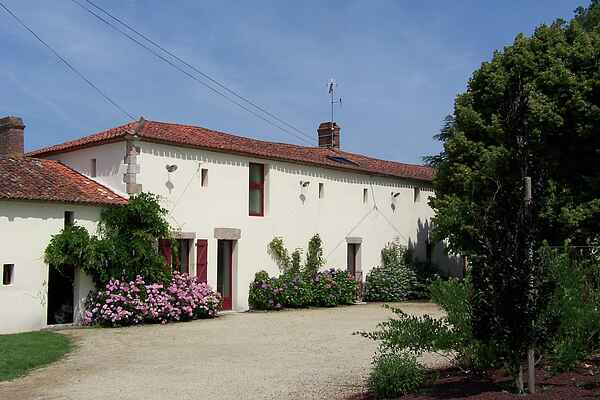 Discover this wonderfully renovated holiday home, dating from the 19th century! You find yourself in the 'garden of Vendée'. You can enjoy the pool. In the garden, you can relax on the sunlit terrace. While you start a new book, the kids can play ping-pong or gather fresh eggs from the poultry house. Don't forget to watch the wonderful starry sky at night! Enjoy barbecuing, there is one at the terrace. A great way reminisce about all the sights that you've seen in the area today. The lovely undulated, wooded landscape is ideal for walks. Of course we'll start by going to the center of Les Brouzils (1.5 km) where you can buy fresh croissants and baguettes for breakfast at the bakery. For cultural outings you can visit several medieval towns. Some suggestions: Montaigu (10 km), Clisson (28 km) and Tiffauges (30 km). The latter owes its fame to the Château de Tiffauges or Bluebeard's Castle. Do visit 'Les machines d'Ile', this is where Jules Verne's and Leonardo da Vinci's wild ideas are converted into actual functioning machines.